The date had finally arrived. It was April 10th. With a child like excitement and exuberance, we hooked up the 5th wheel and readied everything for our twenty-minute drive up to Dead Horse Point State Park. As excited as I was to head to a new campground, I was reluctant to bid farewell to our awesome boondocking site. boondocking near Moab, Utah. 360 degree views! 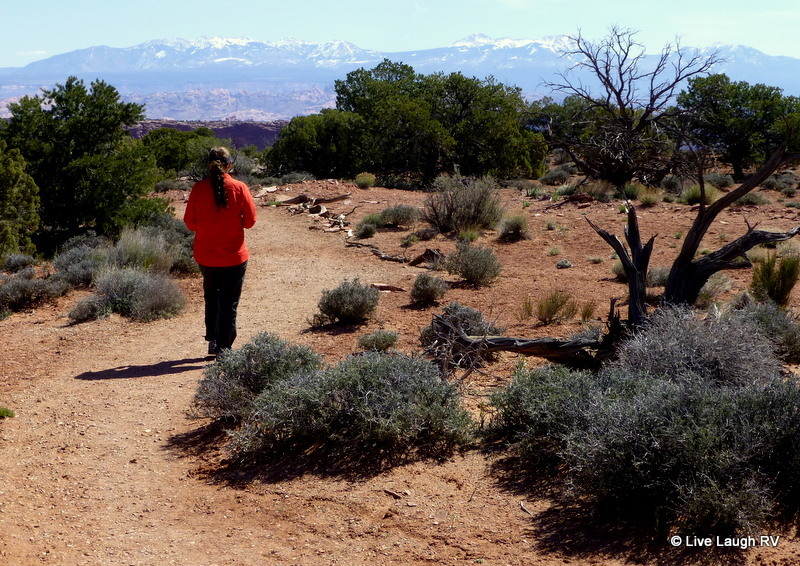 Arches National Park can be seen in the distance on the left with snow capped La Sal mountains to the right. I made a reservation (along with my brother) to camp at Dead Horse Point State Park a few months ago. Last fall when we visited the Moab area we stopped by Dead Horse Point State Park and did a quick drive through the campground. I decided right then and there that I just had to stay at this state park sometime. One of the rare level sites….score! During that exploratory drive, I made notes as to campsites we might fit into. It’s because of campgrounds like this that when it came time to choose an RV, Al and I made a conscious decision to buy a RV that would not be too large and thus able to fit into some of these tighter campgrounds. Let’s face it; size does matter! If we had opposing slides or been much longer, we would not have fit so nicely into this site. 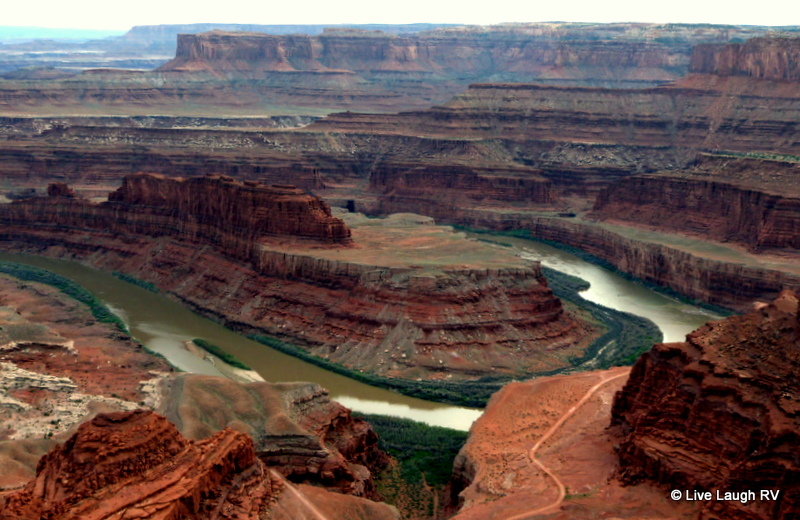 Most of the campsites at Dead Horse Point State Park are narrow and unlevel requiring some extra maneuvering or inventive leveling. The campground is also small with a mere 21 sites which book up quickly. 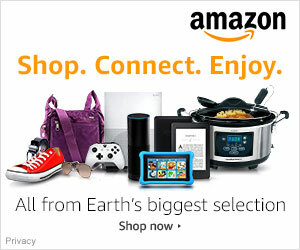 Each site has electric only. Being located up on a mesa, water is not readily available. There’s that precious commodity issue again…..water! Although there is an on-site dump station, there is no potable water to fill RV tanks. The restroom does have flush toilets, sinks for hand washing, but no shower facility. The beauty of having scoped out this campground last fall was Al and I knew exactly what to expect and how to prepare. So with waste tanks empty, water tank full, and our body’s scrubbed we embarked on our 5 day stay at Dead Horse Point State Park. my brother and sister-in-law fit nicely in the campsite across the street from us – site #1. Yep, that white stuff is snow and frost! My brother and his wife joined us by camping in the campsite across from us. Fortunately, my brother and I made reservations months ago for these sites. It was great reconnecting and catching up on life. The weather was perfect……well, almost perfect. We had a snow day with cold blustery winds that kept us indoors most of the day. 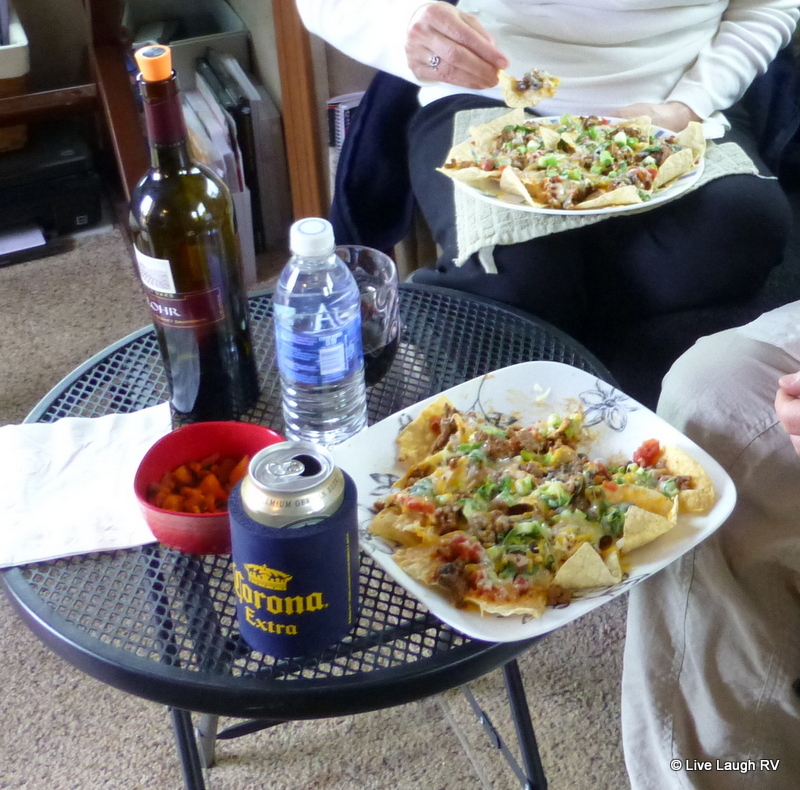 A snow day was the perfect excuse to hang out with family, visit, and enjoy my homemade nachos. 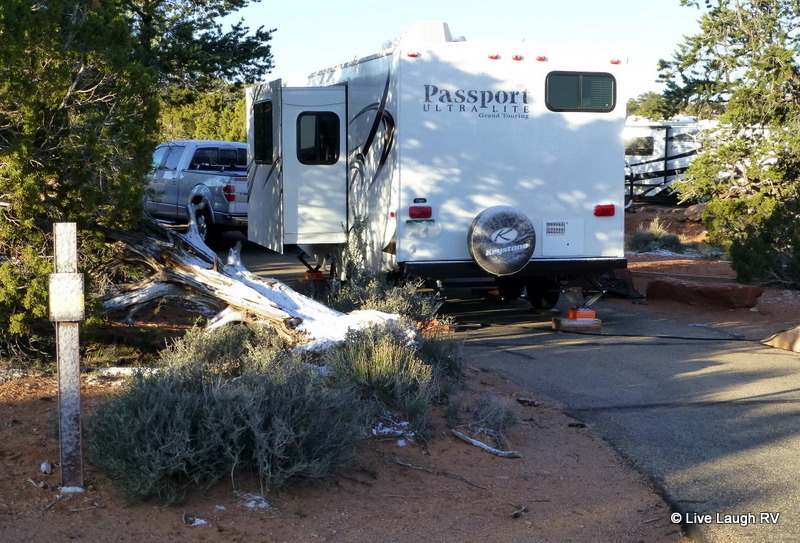 So why was it so important for me to camp here at Dead Horse Point State Park? The scenic views, of course….it’s all about the views. And those views are easily accessed from the campground. The visitor center is a quick walk from the campground and is filled with a wealth of information. This is also a great spot to take in the amazing scenery. While camping 2,000 feet above the Colorado River, I found myself repeatedly walking the rim trail and taking in this amazing scenery. Sunrise and sunset were especially stunning. I just ordered this book. I’ll let you know what I think! Ah what a great post Ingrid … you shot me right back to our trip to Utah a couple of years ago . Although we were not so fortunate as to be RV’ing . I love that idea and would look to do that in the future is we returned if possible . Just the thought of pitching up in amongst such .. *sigh beautiful landscapes is a magnet for sure and now I’m mad on photography well …. Nice spot! Hope you’re all better! Love the last photo. I’m finally back to hiking health. Sure took me a long time! You had us here. That last one, my heart just sank to the beauty of it. Sure is pretty isn’t it! Moab area has a way of drawing you in and never letting go, just checked they have about 5 sites that could fit us 🙂 one of these days. 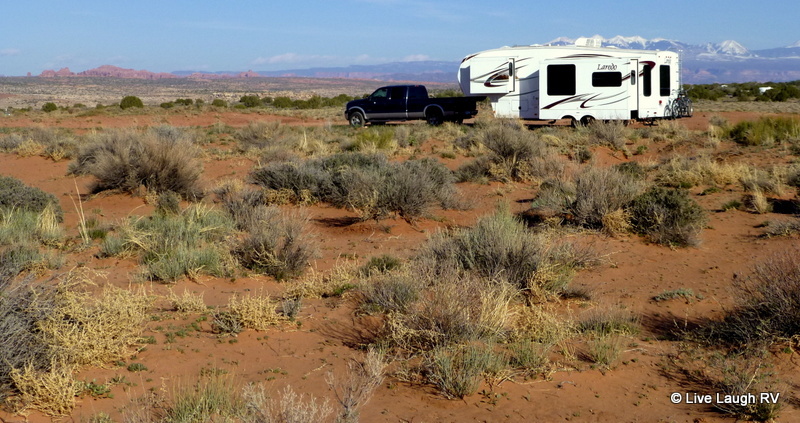 You are right about Moab “drawing you in” as we find ourselves back in Moab today and boondocking. As much as we enjoyed Dead Horse Point we love our little boondock spot. I am overly confident that when our butts get there, I already have the best previews. Excellent shots, Ingrid particularly the last one. Oh yes, like you we will keep coming back for more in those areas. By then our East travels will have been concluded and like you said, hike to our heart’s content. Perhaps you have a better understanding as to why we joke about staying west of the Mississippi River. I have a feeling you’ll be staying west of the Rockies once you cross them LOL. Love that park! Plus we got to hike with doggie there which was a bonus. That last sunset pic is amazing. Nice capture! Thanks Nina and yes the bonus of the state park over the NP is dog friendliness. I loved hiking that rim trail and my brother loved the new bike trails which he says are amazing. Stunning country that I know we’ll return to but will probably stick to boondocking below. 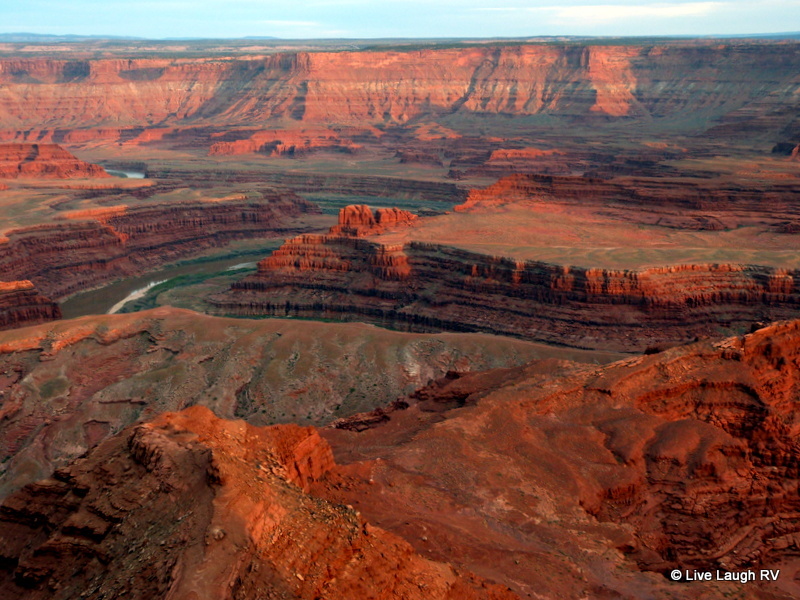 I can see why you wanted to stay at Dead Horse Point State Park, the views are spectacular! Thanks and yes it was so worth staying here to capture the scenery at the various times of day. Looks like a great place. Wonder if I could get our 34 ft Class A in there? It has opposing slides, but one of them is under a foot wide. Thanks for the fine article! What a breathtaking way to wake up in the AM! Thanks for the tip! Another pin in the board. Your final photo pretty much sums up the beauty one finds at Dead Horse SP!! It is a spectacular place…and they have the best design on their shirts:) I loved that they had women’s tee shirts with a cool logo. My sister-in-law picked up a really cool hat there last spring and I wanted one. This year’s merchandise logo seems to be different and I didn’t care for it as much. I’ll wait for next seasons look. Aren’t we a couple of fashionista’s? I loved how you saved the truly stunning shots for the end…those rim trail photos speak volumes…for that alone, the trip is a must. Oh, Ingrid! What an unbelievable view from rim trail…and everywhere!!! We DO have opposing slides, so we would have to really research that one!..Plus, we never seem to get anywhere in the Spring, Summer and Fall,….only Winter…and that prohibits most places out West except Arizona…I soooo envy you right now! Yes, no room without a reservation seems to be the norm at this state park. Hubby was non too pleased with me because it put us on a schedule and we don’t like schedules. Although he quickly got over his displeasure once settled in LOL. The place is indeed beautiful and was worth scheduling. Of course, size matters……. 🙂 and yes I’m talking about the RV….what did you think I was talking about? haha! Hi Ingrid – I see I’ve got a lot to catch up on at Live, Laugh, RV ! There’s always a lot to like here, and something new and breathtaking – you are fun to visit!! Thank you…..it’s been a busy time around the RV and I need to catch up on those whoopers. Hi again! I’ve now “toured” with you through Home With a View, MacGyver, and Dead Horse. I learned a lot and savored the views, and all this mostly-Utah (all Utah? – I better read closer!) beauty is taking my mind off the whoopers, too! These were all just great! Great photos! How wonderful to be able wake up to those views! My husband and I visited this park last year in April so I can understand why you love it so much. We explored the park as snowflakes fell all around. It’s a magical place! Thanks for sharing your journey. My body is itching for some hiking. Thank goodness I’m head back down soon! Your pics have caused severe withdrawals. I really LOVE the campground! What is not mentioned on my blog is that my husband and I currently live in a 40-foot fifth-wheel dreaming of eventual full-time travel. While I am zipping around to the national parks with a tent in the car, Stephen is usually working in the corporate world saving for retirement. 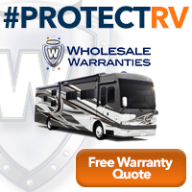 When we do retire and hit the road, we plan on trading in the fifth wheel for a 30-foot motor coach for the very same reasons you chose a smaller rig: fitting into wonderful, remote spaces. Our motto: the smaller the rig, the bigger the options! 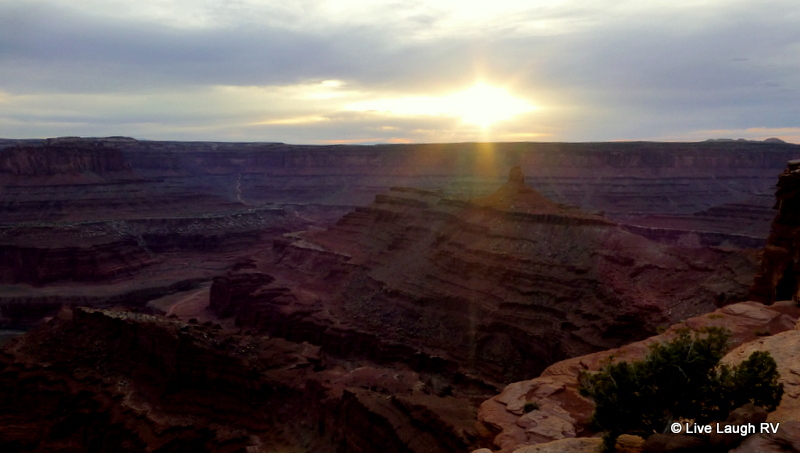 Enjoy following your adventures and have added Dead Horse Point State Park to my list! Oh lucky you. What a gorgeous spot to spend some days… the images are breathtaking. Thanks Gunta…….it was lovely calling this ‘home’ for the week. Since we have scaled back in size a bit on the RV I am hoping we will fit in some of these campgrounds. Just cannot beat the breathtaking views out west, and you have certainly done them justice! Yes, I know the story and it’s rather sad. I thought I linked over to the Dead Horse Point State Park site, but must have forgotten. I’ve been rather busy and rushed lately. Oh well, an idea for another post……guess you’ll have to wait LOL. Beautiful Place and Beautiful Captures 🙂 Placing this one on my MUST SEE list! Happy Weekend. Wow, beautiful photos. I MUST stay at that park and hike the rim trail! 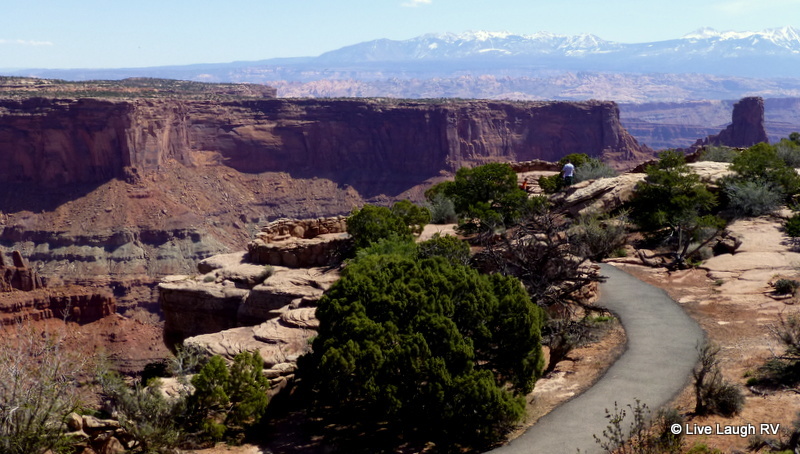 I’m sure you would love that rim trail and you would fit just fine in most of the sites. Reservations are a must, unfortunately! Beautiful! I would like to see this…one day..maybe. It is definitely worth a visit at least once. People from around the world visit Moab, Utah. It amazes me how many people we talk with that were out that way and know nothing of this park It is one of our all time favorite places! The hiking is super. I so agree with you Marsha…..one of our favorites as well. I loved walking that rim trail. The views are just stunning and photos don’t do it justice. Dead Horse Point is beautiful. We loved hiking the rim trails. Drove thru the campground yesterday and you are right. I don’t think we would fit comfortably. The snow was melted by noon and the sun began to warm things up later in the afternoon. No need for Canada Sue’s stylist sleeping bag coat complete with antlers…..well, antlers add a woodsy touch to any outfit…..hehe! We came from a 17′ Casita full time and keep seeing what looked like large RVs (at least to us) but did not understand large size issues. 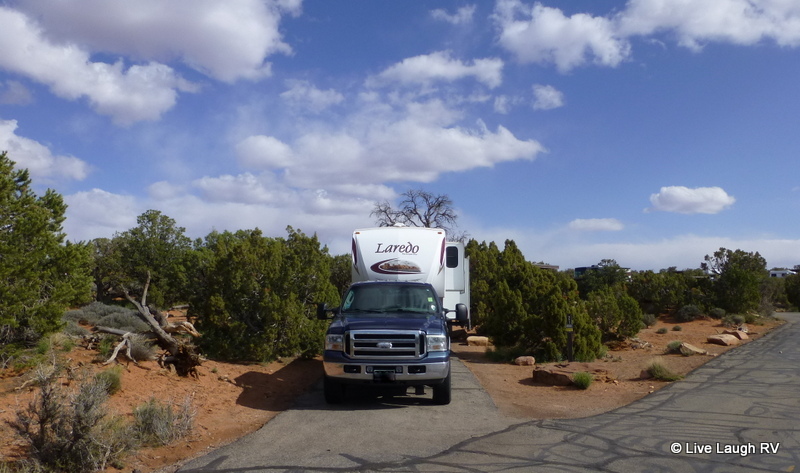 With our 39′ 5er we have learned to do more day trips. Next year we have to go west, love seeing the sun shine in your photo’s and the unbelievable views. I’m ready to go back south but we do need to see this area as it is so different from what we are use to. I grew up in northern IL so the Midwest is old hat to me. Michigan is a beautiful state…..Sleeping Bear, Traverse Bay, Mackinac, Pictured Rock, and upper Peninsula. Thanks this is perfect timing. We have to be in this area another week and did not know where after this. Then we have to be in upper Tennessee early June. I think we are also going to try and make Maine. This is indeed a great park, I’d forgotten just how lovely it is. We are so excited to be going west again this fall! You’ll need to keep me posted on your where abouts so we can either meet up or you can run and hide……your choice….haha! We made a day trip to Deadhorse when we were in Moab a few weeks ago and loved it! Such a pretty place. Now that you’re traveling with a toad, I’m sure it’s a little easier to explore. Utah seems to be one of our favorite states thus I see us exploring it a lot more. I look forward to following your journey this summer. I enjoyed this adventure, and your photos are stunning. 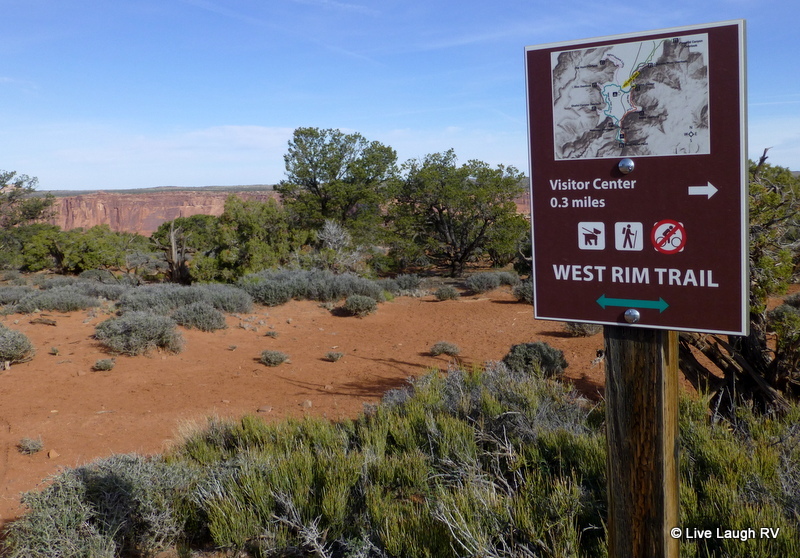 I especially liked the Rim Trail…wow. That trail along the rim was awesome. “Wow” was a word I seemed to repeatedly use LOL. Never been there, and it looks like I need to visit! Looks like the Grand Canyon…without the crowds! 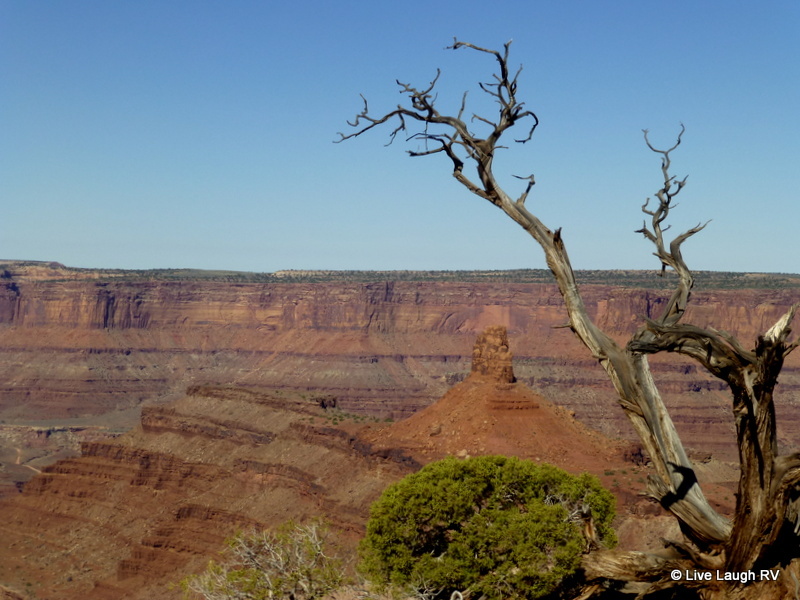 The scenery at Dead Horse Point State Park and Canyonlands is pretty spectacular. Unfortunately, you wouldn’t fit into the campground but I would recommend a day trip and rim hike. Beautiful scenery – I can see why you wanted to stay at Dead Horse State Park. How long is your rig and what size can that campground hold? We stayed in Moab last time, but never made it to the State Park, my bad….. thanks for showing it to us, next time for sure!